People purchasing a home with a private well and water supply may not fully consider the importance of thoroughly testing and inspecting the system. It is vitally important to test the water quality and inspect the water delivery system prior to your purchase. For this is the water that will be used for drinking, cooking, and bathing! 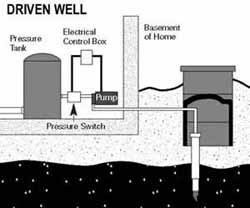 The well system may have mechanical problems or low water flow. These types of issues can usually be detected by simple water flow tests during the home inspection. Water quality problems such as bacterial or chemical contamination present serious health risks and in some instances can be severe enough to render the water supply unusable. The well should be located so rainwater flows away from it. 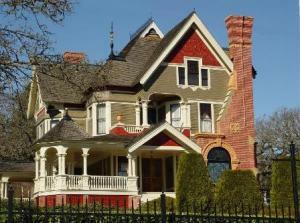 Rainwater can pick up harmful bacteria and chemicals on the land’s surface. If this water pools near your well, it can seep into it, potentially causing health problems. Water-well drillers and pump-well installers are listed in your local phone directory. The contractor should be bonded and insured. Make certain your ground water contractor is registered or licensed in your state, if required. If your state does not have a licensing/registration program contact the National Ground Water Association. They have a voluntary certification program for contractors. (In fact, some states use the Association’s exams as their test for licensing.) For a list of certified contractors in your state contact the Association at (614) 898-7791 or (800) 551-7379. There is no cost for mailing or faxing the list to you. EPA Software for Environmental Awareness -Private Water Systems – A complete minicourse in design and construction of private drinking water systems (wells and piping). Includes water quantities required, water pumps, systems controls, design considerations and piping. Dug wells are holes in the ground dug by shovel or backhoe. Historically, a dug well was excavated below the groundwater table until incoming water exceeded the digger’s bailing rate. The well was then lined (cased) with stones, brick, tile, or other material to prevent collapse. It was covered with a cap of wood, stone, or concrete. Since it is so difficult to dig beneath the ground water table, dug wells are not very deep. Typically, they are only 10 to 30 feet deep. Being so shallow, dug wells have the highest risk of becoming contaminated.To minimize the likelihood of contamination, your dug well should have certain features. These features help to prevent contaminants from traveling along the outside of the casing or through the casing and into the well. 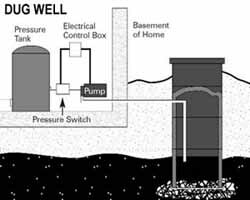 The well should be cased with a watertight material (for example, tongue-and-groove pre-cast concrete) and a cement grout or bentonite clay sealant poured along the outside of the casing to the top of the well. Like dug wells, driven wells pull water from the water-saturated zone above the bedrock. Driven wells can be deeper than dug wells. They are typically 30 to 50 feet deep and are usually located in areas with thick sand and gravel deposits where the ground water table is within 15 feet of the ground’s surface. 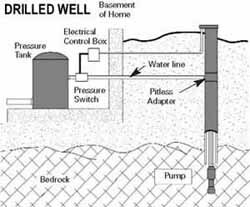 In the proper geologic setting, driven wells can be easy and relatively inexpensive to install. Although deeper than dug wells, driven wells are still relatively shallow and have a moderate-to-high risk of contamination from nearby land activities. Assembled lengths of two inches to three inches diameter metal pipes are driven into the ground. A screened “well point” located at the end of the pipe helps drive the pipe through the sand and gravel. The screen allows water to enter the well and filters out sediment. The casing is usually metal or plastic pipe, six inches in diameter that extends into the bedrock to prevent shallow ground water from entering the well. By law, the casing has to extend at least 18 feet into the ground, with at least five feet extending into the bedrock. The casing should also extend a foot or two above the ground’s surface. A sealant, such as cement grout or bentonite clay, should be poured along the outside of the casing to the top of the well. The well is capped to prevent surface water from entering the well. 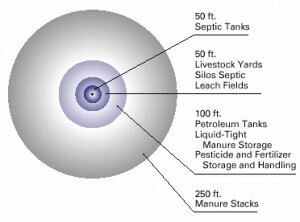 Older drilled wells may lack some of these sanitary features. The well pipe used was often eight-, 10- or 12- inches in diameter, and covered with a concrete well cap either at or below the ground’s surface. This outmoded type of construction does not provide the same degree of protection from surface contamination. Also, older wells may not have a pitless adapter to provide a seal at the point of discharge from the well. For more information on wells and well water quality we recommend the links and documents we have provided below. Identify potential problems as the first step to safeguarding your drinking water. The best way to start is to consult a local expert, someone that knows your area, such as the local health department, agricultural extension agent, a nearby public water system, or a geologist at a local university (See more detailed information below). Also see Drinking Water from Household Wells for more information and help. Such a good post. Worth to share to everyone out there. I am keeping your site to my list, and so I can visit it anytime.